April showers bring May flowers, and many of us will be working in the garden trying to beautify our yards. Gardening seems like it is a pretty safe pastime, however there are numerous hazards that can be encountered in the garden. You could come across a snake, hurt your back, get sunburn or get inoculated with a pathogenic fungus? 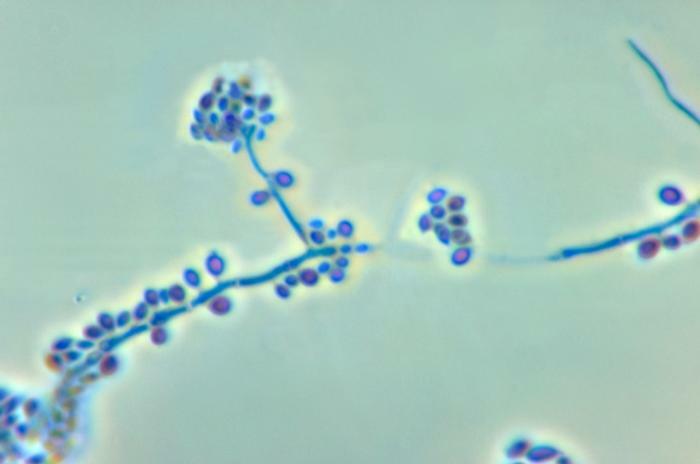 Sporothrix schenckii is a fungus that grows well in soil and other decaying vegetation. It is particularly associated with sphagnum moss (peat), hay, lumber and rose bushes, hence the nickname, “rose-gardener’s disease”. It usually enters the skin through minor trauma like a thorn or splinter. It can less commonly be inhaled and cause pulmonary infection. Typically lesions will be found on the hands or forearms. The appearance of a small, painless red bump may present itself after several weeks. It may look like an insect bite or a boil and eventually ulcerates. It can spread via the lymph nodes up the arm or leg. Disseminated infections of the disease may be seen (lungs or central nervous system) but that is usually restricted to those with an impaired immune system. In addition, alcoholics seem particularly prone to this infection. The infection will not resolve itself and you will need to see your physician for appropriate treatment. Diagnosis is based on submitting a sample, usually a biopsy or swab, to a laboratory for a fungal culture. There are several anti-fungal medications available for treatment. How can you prevent this disease? The use of gloves and wearing long sleeves will help prevent abrasions. Particular care should be taken if you have a compromised immune system, not only for Sporothrix, but several other infectious agents that could be present in your garden.